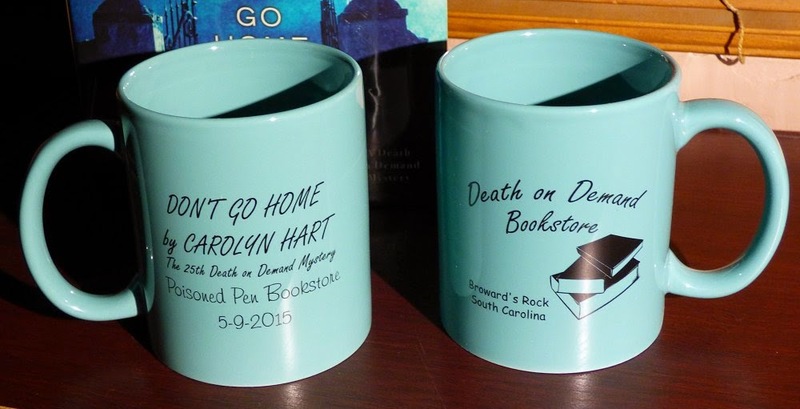 Saturday, May 9, I was fortunate enough to attend the Death on Demand Party (AKA Cozy Con 2015) at The Poisoned Pen. Naturally I picked up some goodies, and I'm going to be sharing them all with you! This first giveaway is for one autographed copy of Carolyn Hart's latest Death on Demand mystery, Don't Go Home, and one commemorative mug from the party. That's right. One winner will receive both the book and the mug! 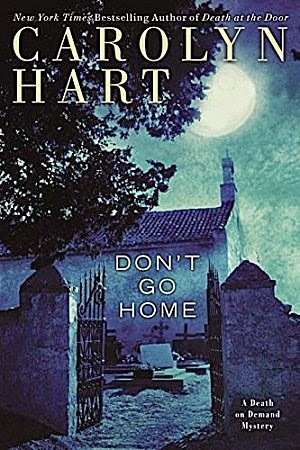 "Annie Darling, owner of the Death on Demand mystery bookstore, is hosting a party to celebrate successful Southern literary icon—and former Broward’s Rock resident—Alex Griffith and his bestselling new novel, Don’t Go Home. But after the local paper announces that Griffith aims to reveal the real-life inspirations behind his characters, perhaps the author should take his own advice. Not everyone in town is ready to give him a glowing review. As Annie attempts damage control, her friend Marian Kenyon gets in a heated argument with Griffith. It’s a fight Annie won’t soon forget—especially after the author turns up dead. Despite an array of suspects to match Griffith’s cast of characters—and a promise to her husband, Max, to steer clear of sleuthing—Annie’s not about to let the police throw the book at her friend when the real killer remains at large…"
If you're having trouble reading that fine print, just click on the photo and it will automatically open in a new window in its original size. On one side is a graphic of a stack of three books and the words "Death on Demand Bookstore, Broward's Rock, South Carolina." 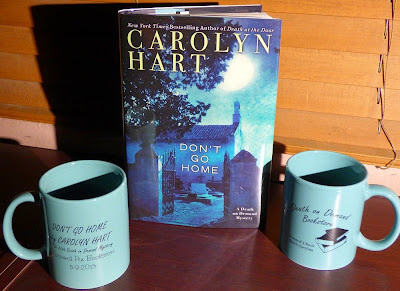 On the other side: "Don't Go Home by Carolyn Hart. The 25th Death on Demand Mystery. Poisoned Pen Bookstore. 5-9-2015"
Okay now... what do you have to do to be eligible to win the book and mug? The subject header of the email must read "Death on Demand Giveaway." The body of the email must contain (A) Your email address, and (B) Your mailing address. That's it! I believe in simple rules, but all three of them must be followed, or your entry will not be eligible. This giveaway will run through Tuesday, May 26, and the winner will be announced here on the blog on Wednesday, May 27. Good luck to you all! If you haven't already liked Kittling: Books' Facebook page, you might want to do so. If you already do, you might want to make sure that you get notifications from it. Why? Because that's where I'll be giving away autographed copies of the rest of the books I picked up at the Death on Demand Party, that's why! I'd hate for you to miss out! Ah! I can at least enter this one. Cool!